Rumors continue to circulate that Google is working on a Nexus 9 tablet, and a newly leaked keyboard case adds fuel to the fire. Google has been very quiet as of late about the future of the Nexus device line, but one rumor that pops up consistently is a new tablet known as the Nexus 9. As the name implies, this would be a 9-inch tablet as opposed to the usual Nexus 7 which clocks in at 7-inches. 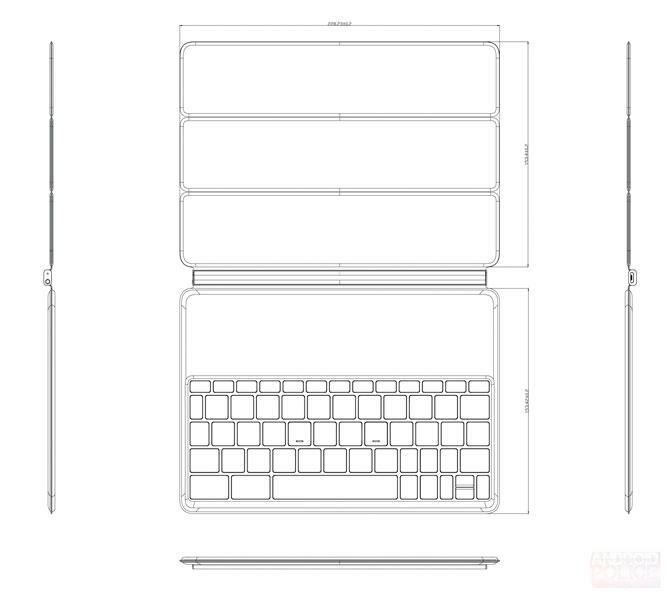 While the tablet itself is still unconfirmed, AndroidPolice have uncovered patent drawings for a keyboard case for the allusive tablet. According to the filing, the keyboard will connect to the Nexus 9 via Bluetooth 4.0 and include its own 450 mAh battery as its power source. The case will measure just 5mm and features a charging port at one end of the hinge, and an LED indicator at the other end. As the keyboard works off of Bluetooth, you will also be able to detach it from the other half and work separately from the tablet to get a better viewing angle if you need it. We still aren’t sure when the Nexus 9 will be officially announced, but in general it is believed it will be unveiled around the same time as Android L is launched to the masses. Currently the belief is that will be some time this fall with many believing a late October release is in the cards. With all of the other devices set to launch over this month, it looks like it’s going to be a very busy pre-holiday season for gadget fans.